I began in the sport of AKC dogs during the early 1970’s with my first dog – Golden Retriever “Wendy”, who became a breed CH, UD, WC. I was hooked in all areas of the sport! In 1977, my Golden Retriever, “Streaker”, was the number one obedience dog in the United States as well as a breed champion and an owner-handled group winner. I am an active participant in conformation, obedience, rally, tracking, retriever tests and field trials, herding, nosework, agility and bred “Dasu Goldens” for many years. My Golden, “Rabbit”, earned her CH entirely from the BBE class and my Golden Retriever, “Allie” qualified for the AKC National Agility Championship four years in a row. I am a member of the Golden Retriever Club of America, the NORCAL Golden Retriever Club, the National Association of Dog Obedience Instructors (NADOI) and served as the organization’s corresponding secretary for six years. I am also a founding member and consultant for the therapy dog program at our local hospital. I have been an AKC judge since 1985 and am currently approved for all levels of AKC obedience, rally and agility. In the past I have judged many AKC retriever hunt tests at the Master Level. 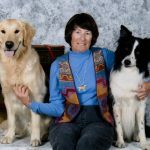 I have served as show and obedience chair for the NORCAL Golden Retriever Club specialty and also chaired the Del Monte Kennel Club’s annual agility trials as well as their obedience program. I am a life member of Del Monte Kennel Club and was presented with the AKC Outstanding Sportsmanship Award. I taught at Ian Dunbar’s Sirius Puppy Training program in Carmel for thirty years and helped the first video of that name. I was an active member of APDT from it’s founding.